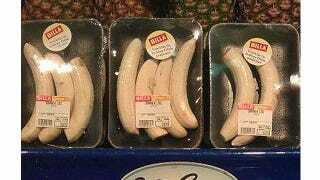 In what has to be the worst case of wasteful packaging in the history of modern conveniece, a grocery store in Austria is actually selling pre-peeled bananas that have then been re-packaged in cellophane-covered foam trays. One of the reasons bananas have been billed as the world's most perfect food is that they come with their own biodegradable packaging straight off the tree. And it's not like you need a knife or some wacky kitchen contraption to peel them—the skin practically falls off on its own. Not surprisingly most customers are up in arms over the ridiculous repackaging stunt, except for the chain's animated clientele who are optimistic the banished peels will dramatically reduce the risk of countless cartoon slipups.